Eight Flavors introduces the explorers, merchants, botanists, farmers, writers, and chefs whose choices came to define the American palate. Lohman takes you on a journey through the past to tell us something about our present, and our future. We meet John Crowninshield a New England merchant who traveled to Sumatra in the 1790s in search of black pepper and Edmond Albius, a twelve-year-old slave who lived on an island off the coast of Madagascar, who discovered the technique still used to pollinate vanilla orchids today. 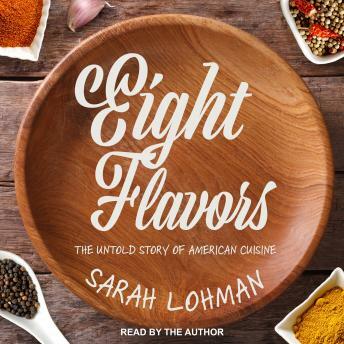 Weaving together original research, historical recipes, and Lohman's own adventures both in the kitchen and in the field, Eight Flavors is a delicious treat-ready to be devoured.